HiTechnique is a managed services provider delivering outsourced IT services to small and medium businesses across the Northwest. We are currently seeking a Network Consultant/Systems Engineer in Spokane WA to be involved in all aspects of network management and support of our SMB clients. Responsibilities include strategic planning, design, installation and support for our contract clients. HiTechnique is a regional IT consulting and managed services company. We pride ourselves in developing effective long- term relationships. We apply practical services and solutions that deliver tangible results for our clients. Services include 24×7 network monitoring, proactive maintenance and support, project management, systems integration, infrastructure management and end-user support, as well as strategic business and technology consulting. Founded in 2002 and headquartered in Spokane Washington, HiTechnique is a leading managed services provider in our region. Just as we have built our business on the success of our clients, our continued company growth and achievements are built on the success of our team members. At HiTechnique we believe our employees are our most valuable asset. Some highlights of our benefits package include: paid time off, paid holidays, medical, dental, vision, life and disability insurance. HiTechnique is an Equal Opportunity Employer. 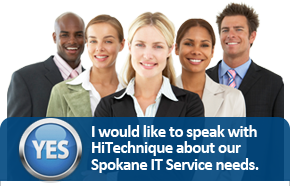 Looking for a rewarding Spokane IT career – contact us today at info@executech.com.